Just another example of AO’s ever expanding portfolio range, this 2017 “La Señorita” displays sentuality and elegance with a touch of mystery. This beautiful 24″ x 36″ piece is a wonderful example of Oropeza’s desire to work with different subject matter, themes and females, as the focal point in his new 5 piece series. 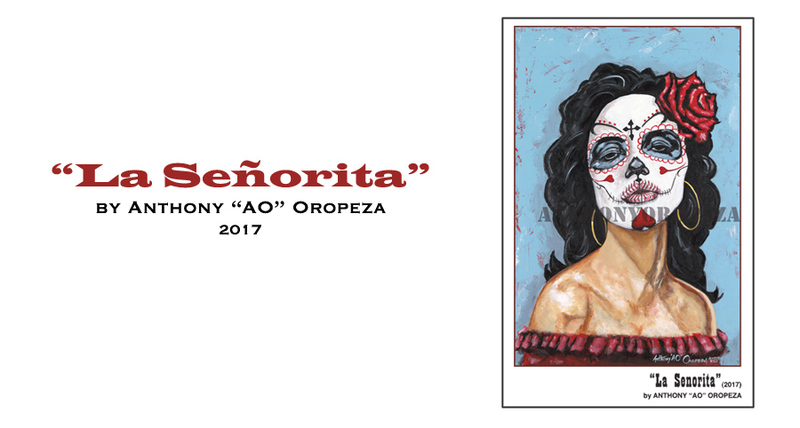 “La Señorita” is the first of AO’s five (5) piece Day of the Dead series. This romanticness of this piece not only captures the expressive beauty of the body position, but there is a certain allure about the face. The eyes, the lips, the upside down heart on the chin, although covered in make-up, keeps the viewer fixated, as it captures you, holds you, with a bit of intent of not letting you go. AO’s first Day of the Dead piece is simply – “Beautifully Hypnotic”. After this piece, AO believes there are more Day of the Dead female pieces in the future. His goal, with this Day of the Dead series, is to feature them at a Day of the Dead event in his home town of Kansas City. AO is currently in the studio working on the next piece – along with his other projects. Original artwork available for purchase – Image is also available for magazine, album covers, or advertisement. Order your autographed print today via our The AOART5 Store.